Here, brush cutter refers to a horizontal and heavy-duty mower that has 2-3 blades. On the other hand, flail mower refers to large spinning cylinder that has various interchangeable/removable knives or teeth. Though applications don’t differ a lot between these cutters; they do work to accomplish different tasks. Despite cutting brush fine, a flail mower is confined to be used until here only. To clean excess brush, having a brush cutter is the only solution. Flails are excellent when it comes to work with thick vegetation and tall grass. Determining the pressure and flow of excavator is important to equip the mulcher with relevant pulleys, pump and belts. 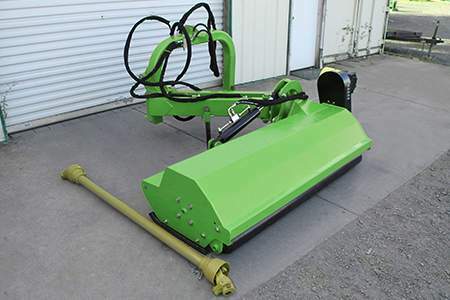 As uses and opportunities for flail mowers and brush cutters are increasing, factors like weight, hydraulics, size, cost and horsepower have to be considered to make the best selection. First things first, check the lifting capacity as well as auxiliary hydraulic system of the excavator. Size and power of attachments are determined by the auxiliary hydraulic system specifications of the mini excavator. Generally, the hydraulic specifications vary from 5 to 40 gpm and 2,700 to 4,100 psi. In terms of safety, fuel economy and maneuverability, it is good to consider light weight brush cutters and flail mowers. Owing to the risk of flying debris, it is important to ensure that the excavator has impact-resistant shielding. Apart from this, the equipment should never be operated around people or property. Brush cutter is fluent in clearing dense brush and saplings using two or three spinning steel blades. On the compact excavators, cutting width for brush cutters may range from 36 to 66 in., whereas, exact attachment weights fall between 600 to 1,500 lbs. Major components that must be checked are the blades, welded collars, hydraulic motor, hose arrangement & deck construction, gearbox and side chains. Gearbox, engine and workers are protected by deploying technologies, such as case drains, stump jumpers, blade shut-off protection and cushion/relief valves. These are used for stump removal, elevated shrubbery, thicker trees, general brush cutting and vegetation that is hard to reach. These are available in many sizes, brands and options. As far as small excavators are concerned, light-weight models that enable precision cutting and easy maneuverability are the ideal choice. Then there are Y-blades that are excellent to cut overgrowth and tall weeds. Talking about hammer blades, they are good to be used when mulching trees and damage foliage. Units that are light weight, stable at full reach, possess favorable boom reaction and use high efficiency cutters that require least power and are good at quick spooling are purposeful. Flails are meant for light applications and are good for hobby farmers, as they are involved with light maintenance work. Fixed tooth mulchers are meant for professional and heavy-duty applications where production is as high as industrial production.